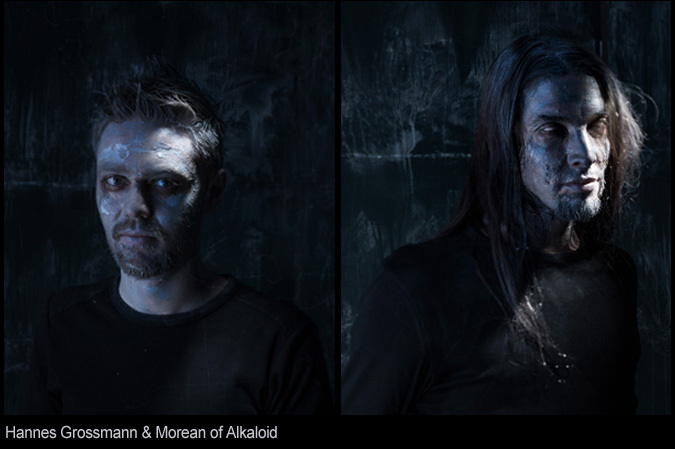 German Death-Prog supergroup, Alkaloid, who have taken the metal world by storm with their explosive debut, "The Malkuth Grimoire" in March, will be finally taking the show on the road this week to Ireland for three dates before heading to Egypt to shoot their first video, the skull-splitter, "Cthulhu," with necro-visionary, Nader Sadek. "We're flying to Cairo, then we have two days to do the video shoot," Hannes Grossmann, drummer elite and founder, said. "Nader is a video artist. He does a lot of stage props, creates art, does comic books and all that – a lot of stuff and it's really impressive." Triple-threat vocalist/guitarist/composer, Morean, explains, "The cool thing about this guy, Nader, this very guy, he is going to do our video. He offered, which I think is a fabulous offer, to do the clip if we would also consider doing the show, which is perfect." He adds, "We get to go down to Egypt, in the crinkle of civilization, and we're shooting a video in a fucked up building around the corner."